This month, Supercell released some of the new Sneak Peaks, Check them out on their Official Site. So People like to try those new things such as Electro Wizards, Executioner and lots more. They cannot wait till the update to come. 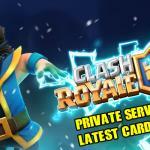 They can quench their thirst download latest version of Clash Royale Private Servers and also they can Clash with Unlimited resources. Playing in Clash Royale Private Servers is always fun, Because of the privilege we get in the Private Servers. You might be a noob in the Clash Royale official servers; There may be plenty of reasons for it, One of the main reason is you won’t have any overpowered cards, Whereas your competitor would have. The main advantage using Private Servers is you can have whatever cards you want. In this article, We are going to provide two versions for Android users; One is for rooted phones and another is for normal Android phones. The Same thing is for the IOS one is for JailBroken devices and another is for non-Jail broken devices, We have tested two methods which are working perfectly. And some other methods were tested by our developers :), And they said its working. All these methods are tested and is working, If any methods not working, Donot give up at first try, Try using another method, If You still face any problems, You can contact me anytime. 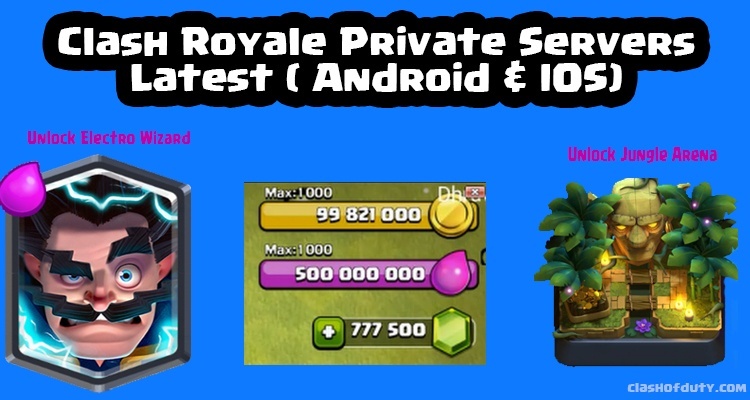 If you used Clash Royale Private Servers before, Then you might know what are the things basically in it. Some additional things are added along with it in this new version of private server. New troops such as Electro-Wizard, Executioner, Battle Ram and much more added. Unlimited Gems, Elixir as always. Elixir will no longer be loading. It will stay constant at 10. You can create a new clan. These are some of the Pros in this latest version. Playing in Private Servers have some cons, Because prolonged cheat mode on causes boredom. Sometimes, It lags stupidly and for IOS users mainly depend on the user location. Irritating when played prolong, Because it’s not interesting as playing on Clash Royale Official Servers. Sometimes, Disconnects while battling inside. Android users, Follow the simple steps mentioned below. Before proceeding, Make sure you don’t use the Gmail id which you use to login Clash Royale Official Servers, If you do login, You will be in risk of getting banned by Supercell, Do it carefully! Download any one of the files present above. Make sure, You have working fast internet connection. Sign in with any other Gmail account. This method is much more complicated than the first method. This method requires you Android Device to be Rooted! If your device is not rooted, You can search for tutorials on Youtube, On how to Root. Tap +Add Host button which is present top right. Type your real IP address which you can find by googling what my IP is. Then in Hostname type gamea.clashroyale-guide.org, Above I made for Clash of Clans. The Private Server will be launched. In this method, As mentioned in the title No Jailbroken Device is required, However, don’t use the Apple ID which you use to login to the official servers, Use or create some other non-used ids. This method is full and fully Geo-Based, Users have to select DNS according to their locations. We don’t have Clash Royale Private Servers DNS for all the countries, But we cover the major part of the globe, If you are not covered in this list, Don’t worry, We will add your location soon in the next update of Clash Royale Private Servers DNS list. Now, Tap on the i near your SSID. Then type the DNS according to location. Now start the Clash Royale and you will see Private Servers loading. Wait for 5 to 10 seconds, Sometimes the Private Servers needs updates too. To make this work! Your ISP should not be behind any UDP ports, If you are behind any firewalls, Contact your ISP to fix it or else do Port forwarding, Yo can find tutorials on Youtube according to your ISP. This method requires a JailBroken device, If you have any old iPhones, You can Jailbreak it, Check some tutorials on Youtube. Once you are done, Follow the steps mentioned below. Open the file, And navigate to />>etc folder. Search for hosts file and open it with Text Editor. Tap return button, Save the host and close the iFile. Now open Clash Royale, And play it in Clash Royale Private Servers. The video, Will demonstrate you, How the private servers work, however, it will not mention any of the methods which I listed above, This video is for fun purpose, Enjoy watching it. It’s time to close this article, And start gaming on Private Servers, The much-awaited troops such as Elector Wizard, Executioners and you can also use all of the troops, With unlimited Gold, Elixir and Gems, IOS users choose DNS servers based on your locations, Don’t get upset, If it is not working for the first time, My friend got connected to Private Servers after he tried 3rd time, Do subscribe and we will update the Servers and DNS often. Thanks for Reading, Have happy time Clashers ! Nice Tutorial, Second Method Working Great. These methods are really working, But the second method is lagging, please check. Yes Jo, People are facing some lags, Wait for the next update and it will be fixed. check the latest version of it. I love the CLashmas Update of Clash royale private. Please, Update DNS address for Bahamas. Try other methods madam, I would love to hear more from you. What are the new cards going to be added? Sam Check latest version in our homepage. adfly not working in my country. Tim, Use proxy or Vpn. The servers works only 2 hrs per day, As by research. oh, I though it works more than 12 hrs. please update nxt version of clash royale private servers. Sure, Just subscribe and wait. I have one problem, i don’t know what my hosts file is supposed to look like can you send a screenshot? Ryan, It looks like command prompt, Do check it.